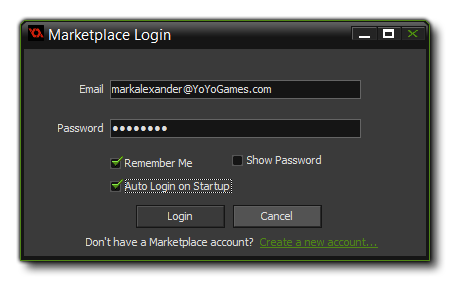 This week we saw the launch of the YoYo Games Marketplace and an update to the 1.4 version of GameMaker: Studio. This update permits you to create content for other people to buy (or get for free) through Marketplace. 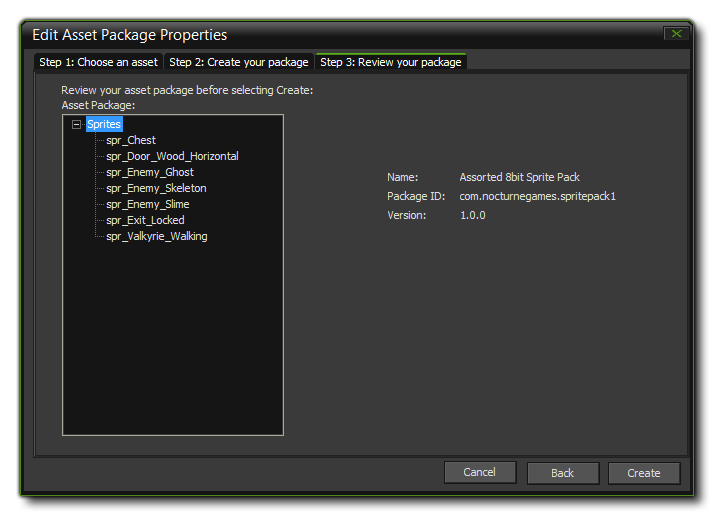 To do this, you will need to be able to create asset packages, which are GMEZ style files containing the assets from a project for distribution, and they can include sprites, audio, scripts, extensions... basically anything that goes in your games resources tree can be packaged up and added to Marketplace. To prepare you for the launch and to give you a point of reference for getting started, in this article we will show you how to go about setting up an asset package and get it ready to put on Marketplace. Please note that this is only the GameMaker: Studio side of things being covered here, but you will need to have a Publisher Account on Marketplace and have created a Market Listing for your assets before you can finally upload them. Details of how to go about these things will be made available nearer the Marketplace launch, either as further tech blogs, or as helpdesk articles. Before you can start to create and upload asset packages to Marketplace, you will need to create your Profile certificate. 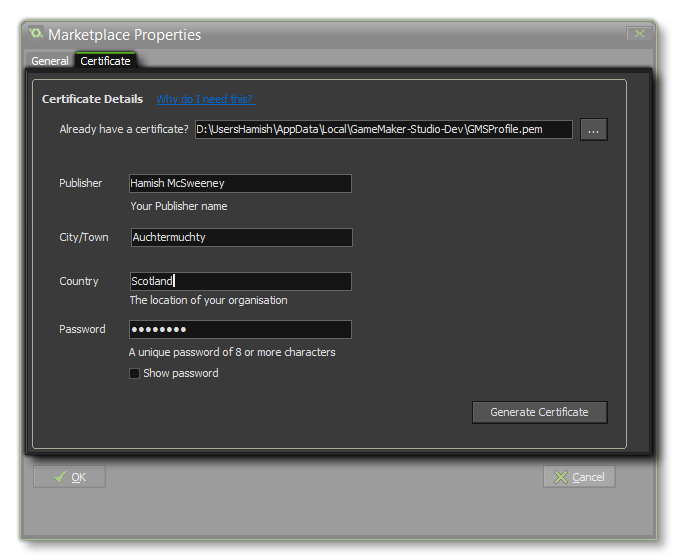 This certificate is used to sign the asset package, and it can be created from the Marketplace Properties window (from the Marketplace drop down menu at the top of the IDE). Publisher Name: The name of the publisher of the assets being uploaded (this is obligatory). Country: The country that the company or organisation is based in. Only the Publisher Name field is obligatory, so if you are an individual developer then you are fine filling out only that part. Next you should choose a password that will be used to protect the certificate file that we want to generate, and then set the location to save the file to (you can name the file anything you wish too, as long as the extension remains *.pem). Now click on the Generate Certificate button to save the file, and it will be used by GameMaker: Studio from now on for submitting to the asset store (basically it proves that you are who you say you are and have permission to modify the content). NOTE: We recommend that you take a screenshot of the actual settings as well as make a copy of the PEM file. 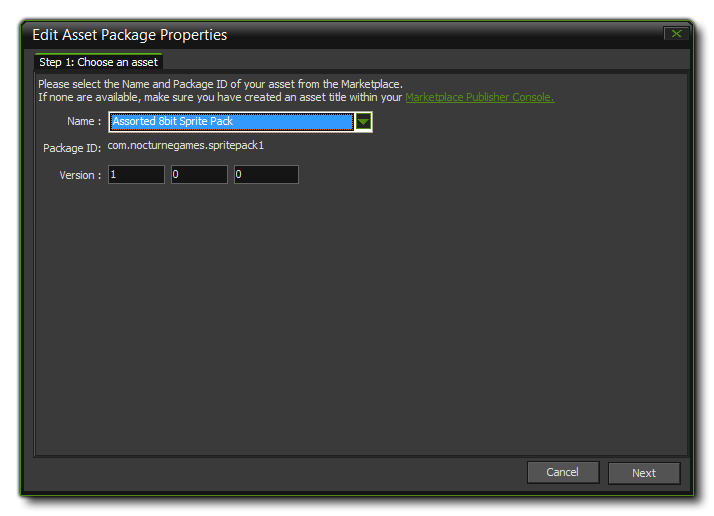 Both should be saved together to a safe location for future reference, or in case you need to re-install GameMaker: Studio at some point.You cannot update assets that have already been uploaded unless the updated package is signed using the same certificate that the original was created with. Once you have imported or created the required assets, they will be shown in the resource tree within the main GameMaker: Studio window. You can edit them and change them from there, and you can also export them for personal use or for testing as a GMEZ extension package. It is worth noting that no matter what type of asset you are creating, you should make sure to add an Included File (or files) that contain licence information, usage instructions and any other information that the end user may find useful. If you have not already made a publisher account on Marketplace, you can click on the "Create New Account" link to get started (future articles will explain this process in more detail). Once you have logged in, you can check the market listing from your Publisher Profile pages (or even create a new one if you wish) and then click on the Package Manager tab to create your new package. 1) Choose an asset - Here you need to choose one of the asset listings that you have previously created on Marketplace, as well as the version number. If the package is to update an older one, the version must be higher than the one already uploaded. 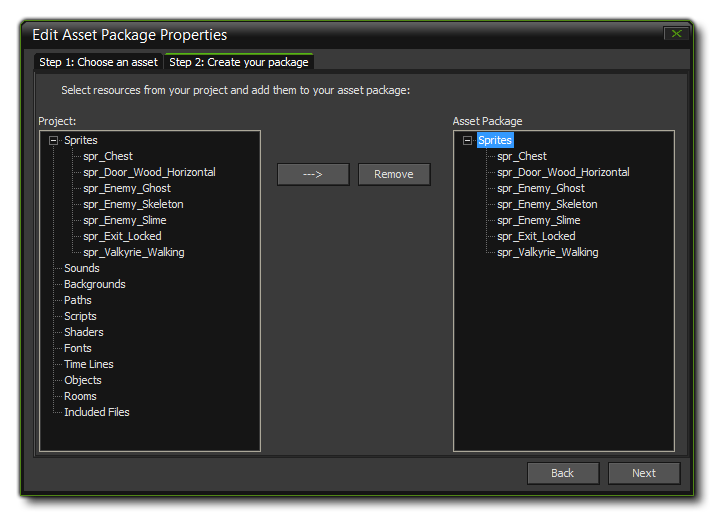 2) Create your package - You need to select the assets that you wish your package to contain. This is done by either selecting individual assets from the resource tree, or selecting a folder (which will add all the contents of the folder to the package) and then clicking the "- - - >" button to flag them for inclusion in the package. This will place them in a duplicate resource tree on the right. NOTE: If you add an asset by mistake, select it from the tree view on the right and click the "Remove" button. 3) Review your package - This last step permits you to review the package contents and its ID and version number. If you have made any mistakes, you can hit the "Back" button to correct them, or you can click on "Cancel" to end the process (all changes will be lost). If you are happy with everything, you can go ahead and click "Create" to create the package. All packages created in this way will be stored in the local app data folder for GameMaker: Studio (%localappdata%\GameMaker-Studio\lib) as GMEZ format files. These can be imported into Studio as regular extensions and will work fine as long as you are the licenced creator, but if you distribute them to others, they can only be used for testing and will not permit final executables to be built using them. The final step is to upload your newly created package to Marketplace. This is done from the Package Manager tab of the Marketplace window in GameMaker: Studio. Once you have created a package, it will be listed in the Package manager window, along with the options to Edit it, or to Upload it. Editing it will take you back through the steps that you followed when creating the package, permitting you to change the ID used, the version number and the assets included. When you are happy that your asset package is all correct, you can hit the "Upload" button to add it to the Market listing. Once you have uploaded the package, if you go to the market listings you'll see the Status set to "Processing". The time this stage takes will depend on the server load and the size of the asset package being processed, but it shouldn't take too long and you will receive an email to tell you when the validation process is complete. We hope that this tech blog gives you an insight into the workings of the new Marketplace and that you are as excited as we are by the new features!